The CTA-owned building, 2525 N. Kedzie Blvd., used to be an entrance for the Logan Square Blue Line. LOGAN SQUARE — For #TBT, check out what the old Logan Square terminal looked like through the years. 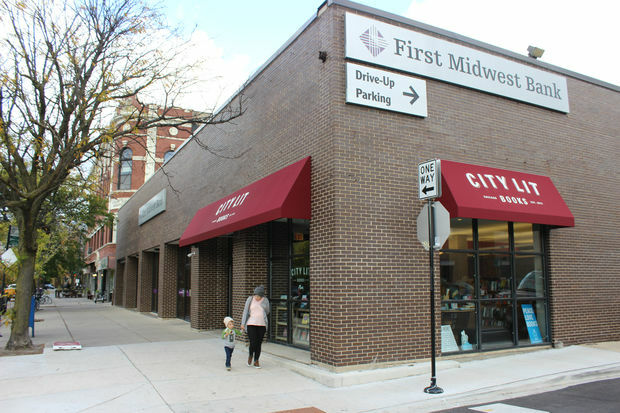 Today, the rehabbed terminal building, 2525 N. Kedzie Blvd., is home to City Lit Books and First Midwest Bank. The building made headlines earlier this week after the CTA issued a request for proposals for the site with the goal of building a huge transit-oriented development there. From left to right the original 1895 station and train shop/shed (second floor), the expanded station with storefronts (1928) and the building with the train shed and platform removed (1972). It's our belief that a substantial amount of original terra cotta remains under the more modern brick facade that was added in the late '70s or early '80s to make the building's facade a uniform height (since they clearly didn't remove the steel frame that used to hold up the train shop/shed). We're hopeful that the CTA's push to redevelop the site will allow us to have some exploration of the facade and result in a sensitive redevelopment and perhaps a restoration of the Kedzie facade. DNAinfo is partnering with Logan Square Preservation on a "Throwback Thursday" post each week. All photos are the property of Logan Square Preservation unless otherwise indicated. For more photos and information, visit Logansquarepreservation.org or Facebook.com/logansquarepreservation.